Hey y'all! Ready for some more of my new demo day series? 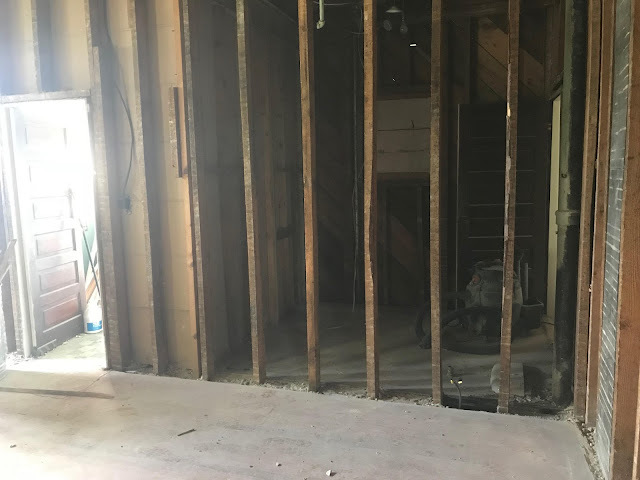 (I seriously need to order those demo day shirts and wear them every Wednesday now) We've been knee-deep (more like neck deep) in rubble and demo over the last week but my goodness the hubs and FIL have been kickin' some major b-u-t-t! Like I mentioned before, this time around we basically have to remove the plaster and can't just dry-wall over top of it in every room. Seeing this house go down to the studs and slats is such a crazy thing to watch! Its almost like you're building from scratch. 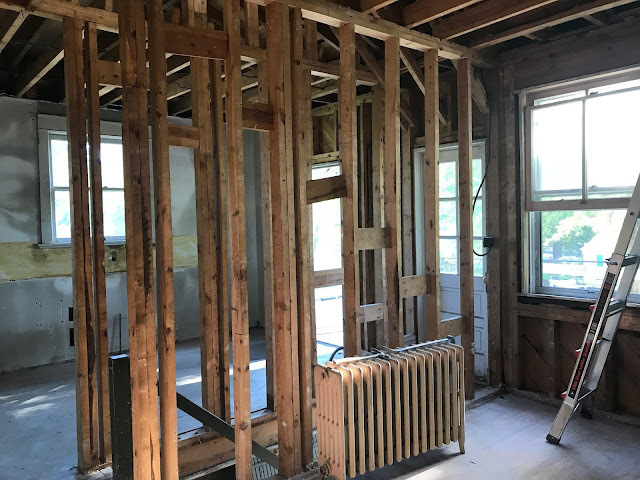 We've exposed the future kitchen, living room, closet and hall bath and it looks insane! 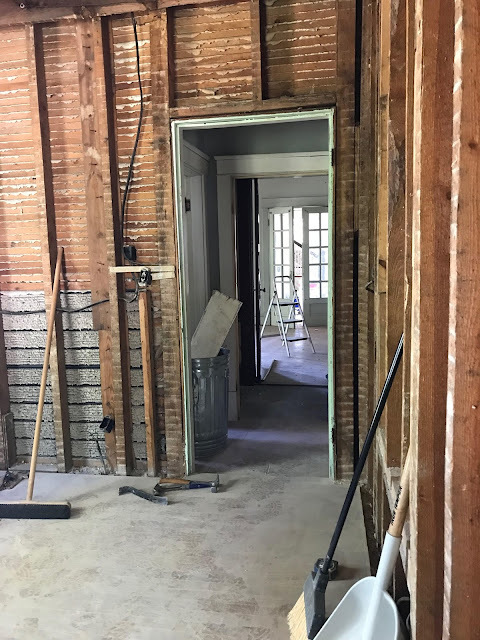 We've also successfully blown through the hall closet to form the future breezeway that will connect the master bedroom to the closet and bath. Its a pretty cool transformation! The structural engineer was great and confirmed our original thoughts for the kitchen. 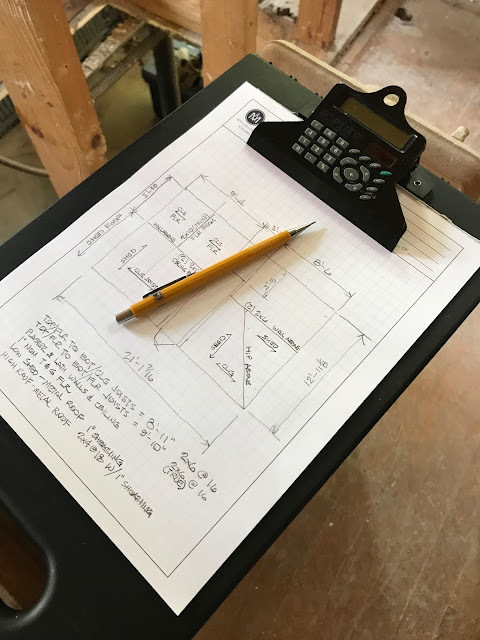 We'll have to install a temporary support wall while taking out the load bearing one of course but afterwards we'll only need to put in two LVL beams (LVL beams are heavier than your standard lumber) around the center ceiling of the kitchen. Luckily these can be hidden and we get to avoid any type of vertical post like beams. He's going to send over the proposal so that in case its needed for a building inspector, we'll have it on hand. Ahhhh I can just see that kitchen starting to come to life! 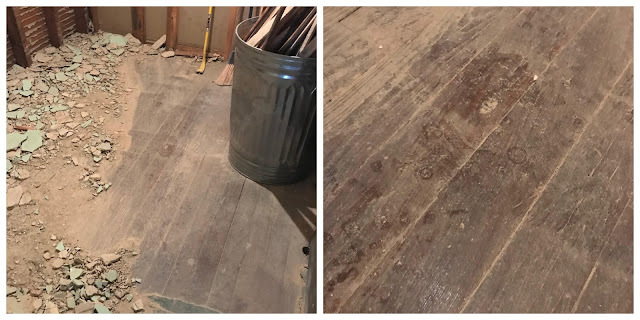 We also ran into a pretty pleasant surprise in the hall bath downstairs (best find of the week by far) We started to play around in there and rip up the rotted old vinyl and much to our surprise there was b-e-a-u-t-i-f-u-l hardwoods under there! We plan to turn that bath into a half bath with laundry included so this was a great score! Ah I just love them! Woot woot! Just to give you an idea of how the plaster removal is going in the living room thus far - looks like a totally different space! The potential is unreal. This was the living room last week and then the after 'in progress' pics I took yesterday. Check back next week for more updates and thanks for linking up! 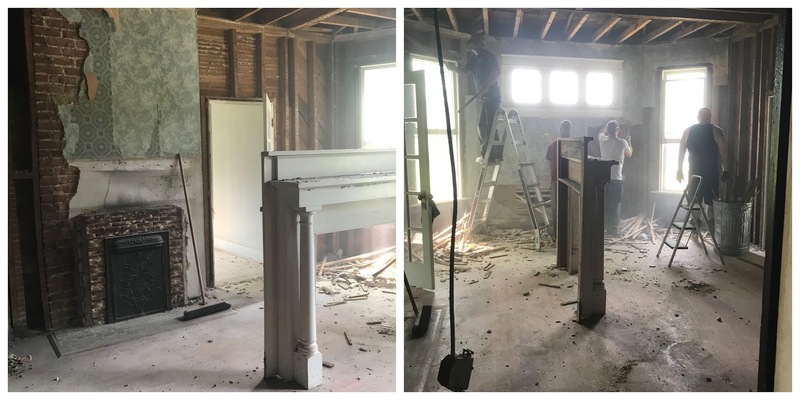 This is like a real life episode of Fixer Upper and I'm totally obsessed! 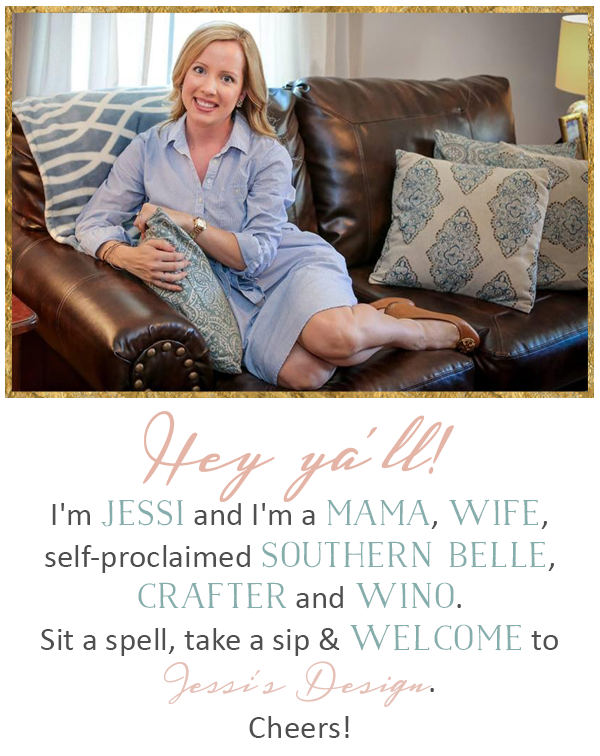 I also think you need t shirts that say Jessi Design!! So much progress already!! I can't wait to see more! I love watching your IG for the updates and then seeing even more here. You guys are rocking this reno!!! What a find indeed on those hardwoods! I love demo day updates! So exciting! Yay for some great hardwood floors. It's looking great. Wow, you guys are amazing for doing all of that! I find it crazy that hard wood floors were covered up by tile, carpet, etc. over the years - they are so beautiful! Same with covering up all the brick on that chimney! Wow!! You guys are moving along!! 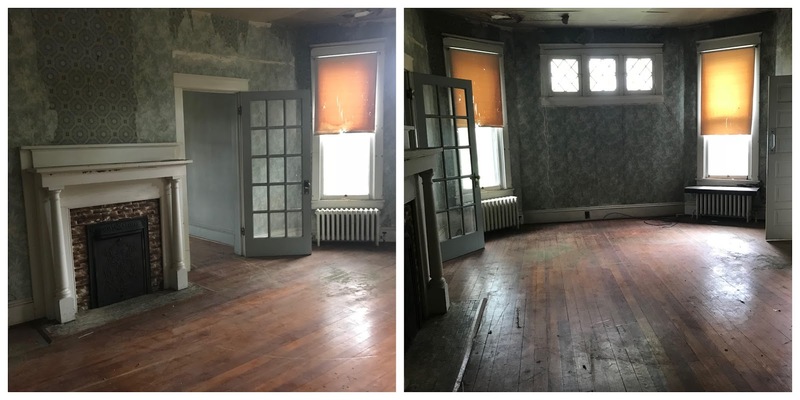 So awesome to find those hardwood floors!